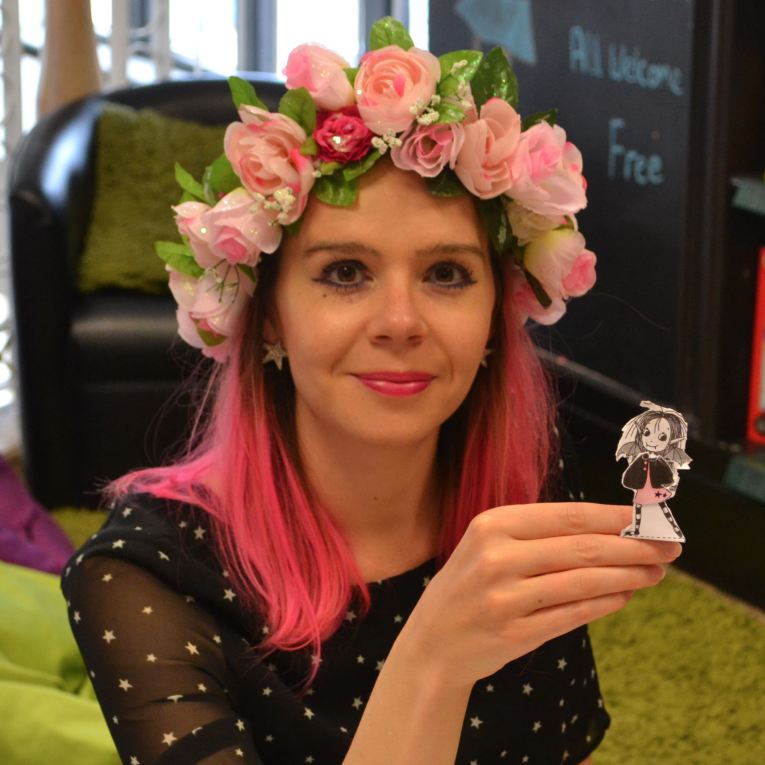 Last week, Derby Waterstones were kind enough to host me for an Isadora Moon event. They’re in a lovely building over three floors, and their children’s section is on a balcony. I actually accidentally knocked off one off the pirate hats you can see in the picture below. It went sailing down to the new releases section! I loved that the children’s section was on a balcony! It was the first event I’ve done outside of Hertfordshire since last year, so it was nice to meet some children who wouldn’t have been able to travel down for my other events. Also nice was meeting some local children who hadn’t heard of Isadora Moon before. One family who did travel quite a way drove an hour from Lincoln. This family drove for an hour from Lincoln for my Isadora Moon event – wow! I hope @willgoodacre doesn’t mind me linking to his instagram in this post, but he wrote an absolutely lovely message about Isadora Moon. It also made me laugh because he talked about how his girls were too ‘awestruck’ to ask the questions they had practised, so he had to instead . He said he was worried he came across as ‘some sort of weird child author stalker’. He didn’t! And of course I’m very happy to answer questions from children or parents. I’m just very flattered that anyone would be ‘awestruck’ meeting me. We also did the ‘Isadora’s Favourite Things’ came after I (re)introduced Isadora using some pictures from the books. I was very surprised when one girl shouted out “I know where that picture’s from: it’s from Isadora Moon Goes to School.” Her dad told me that they had bought Goes to School and Gets in Trouble just before a two-week holiday in France, and she had read both of them five times! This little girl had studied the Isadora Moon books carefully and knew where each picture appeared. Overall, it was a lovely event where I got to sit and chat with lots of different children about Isadora Moon. We also had a nice rest of the weekend, as Henry’s mum lives in Derby so we stayed with her and went out for a big family meal at Ask Italian on the Saturday night. Plenty of glitter was used – I greatly approve! The other thing I wanted to talk about this week is the upcoming Hitchin Children’s Book Festival. It will be the first of what will hopefully become an annual celebration of children’s books in my home time. This is exactly the sort of thing that is perfect for Hitchin! Now that it’s happening, I can’t believe it hasn’t happened before. Of course, for something like this to happen, it needs someone to take the initiative. Danny Pearson is that person. Among other things, he’s an editor and a writer for the Beano. You can find him on Twitter here. He has been putting in loads of time and energy to make this festival happen, and I’m delighted to have been invited to be a part of it. That’s not to downplay the contributions of Sam Mason from the British Schools Museum Hitchin in providing the venue and arranging ticket sales. Tickets are available here, but are limited and have been selling very quickly. As you can see from the poster, I’ll be presenting alongside the illustrious (illustratious?) James Mayhew. James Mayhew is the author and illustrator of the Katie and Ella Bella books. You can read more about him on his website. He was actually one of my tutors when I did my MA in Children’s Book Illustration at Anglia Ruskin University a few years ago. Not only that, but he is based in the town where I went to school. When I was in the sixth form we went to see an exhibition of some of his originals. I found this very inspiring, so my A-level art teacher suggested I might try and get an interview with James for my art project. James kindly agreed and was very generous with his time. As a working author/illustrator myself, I can see now just how generous he was to give up a chunk of his working day to talk with me. It’s strange to say, but I didn’t realise before seeing James’ work and meeting him that illustration was an actual job you could do! No one had told me that at school. I had just assumed you did Fine Art as a degree if you liked art but I knew that wasn’t really where my strengths lay. After the interview with James Mayhew I knew exactly where to focus my passions! It would be fair to say that James Mayhew has had a pretty big impact on my career. Naturally, I’m delighted and honoured to now be sharing a poster with him! I love how the caption lists myself and James and then the ‘Hitchin Children’s Book Festival team’, implying that Celestine (my baby girl) must be a part of the team! Danny has suggested that she could be on tea and biscuits duty. This will work, provided her only duty entails throwing both tea and biscuits on the floor, ideally as a partly-chewed mush. I’d love to see you at the Hitchin Children’s Book Festival. You can buy tickets here. If you can’t make it, then check out my other events on my events page. I’ve got plenty coming up in October across central, north, south and west England – and Henry’s working on a Waterstones visit in the east!